Robin CycFX 4 continues the success story of CycFX 8. This time, the very wide zoom and fast tilt movement come on a 500 mm long strip. Four individually controlled 15W RGBW multichip LEDs in compact size and lightweight aluminum housing with 270 degree motorized tilt can be very precisely positioned, indexed or programmed to produce rapid sweeping movements of 8° beam, smoothened into wide 67° wash coverage or utilize [sun strip] tungsten effects. 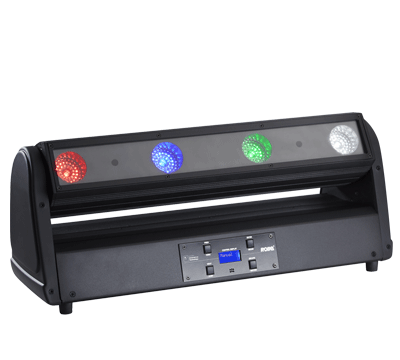 Pixel control possibilities allow pixel mapping while internal pre-programmed color macros make this fixture quick and easy to program even on a more traditional lighting desks. Tungsten lamp emulation and fade effects at 2700 K and 3200 K are included. Wireless technology CRMX is available as an option.